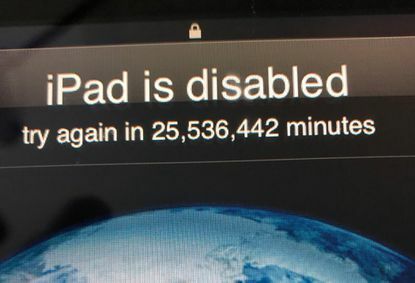 Apparently his toddler tried multiple times to unlock his iPad, until finally the security feature locked it down for 25,536,442 minutes. Twitter did not disappoint in his request for assistance. "Twitter has been a force for good on this one; we've received tons of serious advice", he says. Another person suggested time travel. And of course there was no shortage of memes. A Washington DC-based journalist was locked out of his iPad for almost half a century after his three-year-old toddler tried to use the device with the incorrect password. In order to restore an iPad via iTunes, one must connect the iOS device to the computer, launch iTunes, restore the last back on the iPad/iPhone and sit back while the installation completes.